The first thing you will notice as you enter Poipu Kapili is the sense of peacefulness. This small, private resort is the perfect place to escape and relax. One of Kauais finest luxury condominium resorts, Poipu Kapili is situated on five beautifully landscaped acres, oceanfront in the heart of Poipu. With only 60 condominiums, the property is small and intimate, offering privacy, serenity and all the comforts of home. Each of Poipu Kapilis low rise condos offers magnificent ocean views, spacious living quarters and elegant furnishings. Though renown for a very personal scale of service, spaciousness is the hallmark here. The elegance is understated, and the glorious sunshine is cooled by the gentle trade winds of the Hawaiian archipelago. The great beauty of Poipu Kapili is found in the details. From the friendly, helpful staff to the garlic press in your kitchen, nothing has been forgotten. Each privately owned condominium is tastefully decorated and designed to reflect a tropical ambiance, with features like louvered sliding doors of mahogany allowing cooling breezes to pass while maintaining privacy. High ceilings are framed by beautiful mahogany wood coffers. Ceiling fans in the living rooms and bedrooms ensure your continued comfort day and night. All condos have beautiful ocean views, private lanais and are fully equipped with all the comforts of home including complete kitchens, cable televisions, DVD players, VCRs, and CD players. Laundry facility on property two-bedroom condos have full washers and dryers. 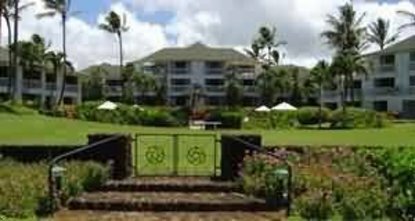 Poipu Kapili is the first condominium property on Kauai to offer high speed internet access in every room. 2 nights deposit required at time of booking with final pymt due 30 days prior to arrival. CC charged at time of booking. Must cancel 15 days prior to day of arrival for refund less $50 cancel fee. Holiday season requires 90 days.